Zorb II™ Diamonds (with the Stay-Dry lining) - The manufacturers of Zorb have changed their diamonds over to a stay-dry lining on one side made of 100% wicking poly to wick up the moisture, but the other side and the inside will remain the same. We will be offering both the Zorb II Diamonds with the added Stay-Dry lining and the Original Zorb II Diamonds. We have heard positive feedback on both fabrics, though most people have their preferences, the Stay-Dry, or the original. 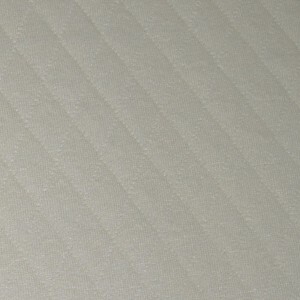 Zorb II - the second generation of the absorbent fabric, Zorb. It is a reversible fabric with a natural bamboo/cotton face on either side with a layer of Zorb sandwiched in-between. The sandwiched layer or Zorb contains only tangled fibers from bamboo/cotton/viscose and poly micro fiber, the same fibers found in virtually every AIO diaper on the market - nothing else! It can be used for a wide range of items, including medical and institutional applications. The durable knitted face and back combined with a thirsty inner layer of Zorb fabric make it possible to make single layer pre-folds, fitted diapers, soakers, changing pads and much more! Very nice for single-layer cloth menstrual pads - just add a water-proof backing of ProCare or PUL and you're done! Zorb II wicks up moisture 20x faster than cotton, bamboo or hemp, and has a much greater holding capacity than any other product on the market! One layer of Zorb will replace 2 layers of most microfiber terry and up to 4 layers of cotton or bamboo french terry! Every Zorb product has incredible holding power - a single layer holds up to 5 times the moisture of the best absorbing knits so leaking and exterior wicking can be greatly reduced. Zorb can be washed using home or industrial equipment and additives. It's absorbency is not affected by hard water or with natural detergent deposits, so diaper-stripping to re-gain absorbency is virtually eliminated. dries quickly, ideal for AIO's - no fussing with pockets! Our Zorb II Diamonds with the added Stay-Dry lining is 45" wide, priced by the yard. Please order in full yards only.